The Ireland East Hospital Group (IEHG) recognises the need for the development of a healthcare system that is sustainable and capable of delivering consistently high-quality services. The Group is committed to this ambition through the delivery of sustainable improvement utilising Lean in healthcare transformation. This strategy commits to using Lean to foster a culture of continuous improvement, aligning business structures, staff and patient engagement, organisational processes and incentives to ensure that IEHG is well positioned in the fast-changing healthcare environment. To achieve this, it is necessary to change the way we organise our services and the way in which they are delivered. Accordingly, a key strategic priority for IEHG is to maximise value for our patients by achieving the best outcomes at the lowest cost using Lean principles and methodologies. In 2016 we commenced implementation of our Lean healthcare transformation and have been working hard to centre our efforts on promoting alignment with key partners, increasing the focus on our patients and staff, delivering better clinical outcomes and improving employee engagement. across our Group, with a key focus on Unscheduled Care. The IEHG Lean transformation plan of care has identified many specialty focus areas for improvement in the next 5 years. This includes how we care for the frail and elderly, the delivery of care at the front door (Acute floor) and the development of Ambulatory Models of care delivery. The Service Improvement team will support sites to share improvements as we strengthen links with services both within our hospitals and in the community. To date we are proud to have engaged more than 1000 IEHG staff in Service Improvement initiatives across hospitals in the Group. 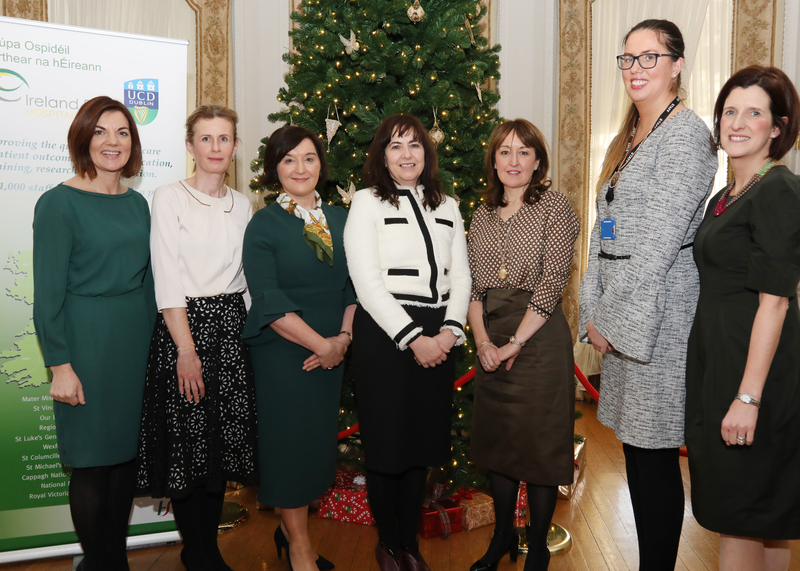 Pictured: The IEHG Service Improvement team with IEHG CEO Mary Day at the 1st IEHG Annual Lean Transformation Summit at Farmleigh House in December 2017.